By now you’ve heard the story many times. Early on the morning of Sunday, June 10, Cape Breton Regional Police were struggling to control a raucous prom party that drew 500 young people to a home in Leitches Creek, a rural district about 10 km. outside North Sydney. At 3 a.m., police inexplicably cleared a young man who’d been at the party drinking all night to drive a carload of kids home. A few minutes down the road, the driver struck and killed 17-year-old Joneil Hanna, who was walking home from the party. Police arrived moments after the accident, but failed to demand a breath sample from the driver. Within hours, social media was alive with rumors: the driver had fled the scene of the accident; he got kid glove treatment because his stepfather is a cop; the two boys were feuding over a girl; the driver and his girlfriend were fighting; police were covering up their decision to let him drive away drunk. The dead boy’s mother sponsored a march to the Sydney Mines police station, demanding “answers” and “justice for Joneil.” The Halifax Chronicle Herald piled on with at least 18 stories in seven weeks, each quoting anonymous teenagers, parents, and lawyers, accusing the driver of criminal wrongdoing and the police of malfeasance. There’s only one thing wrong with the story: Almost every detail is false. Hayden Laffin, 21, the driver of the car that struck Joneil Hanna, did not spend the entire night at the prom party. He and his girlfriend arrived about 10 p.m. with an 8-pack of Twisted Tea, a lightly alcoholic (5%) carbonated beverage in 473 ml cans. Hayden stashed the drinks in their tent, which they had set up the night before. He carried two cans back to the party, and drank them over the next two hours (except part of one, which a friend spilled). Sometime around midnight, Hayden returned to the tent and found the remaining six cans of Twisted Tea had been stolen. He was already restless. Few of his friends were at the party, and now he had nothing to drink. He wanted to leave. His girlfriend wanted to stay. They sparred until about 1 a.m., when Hayden insisted on leaving. His girlfriend relented and went with him. Hayden dropped his girl at her North Sydney home, then headed for his own house, about eight km. away. He was almost there when she called to say she had left her cell phone at the party. Could he pick her up and take her back to look for it? Hayden turned the car around and retraced his steps. The couple arrived back at the party about 2:30 a.m. About the same time, Joneil Hanna, who had no ride home, decided to walk the 10 km. to North Sydney. He and a friend set off on foot. While his girlfriend searched for her phone, Hayden heard police asking if anyone would take home one of the participants in a fight they’d just broken up. Hayden, who knew the combatant, volunteered. The fighter and his girlfriend piled into the back seat of Hayden’s mother’s SUV. “Are you OK to drive,” the cop asked. Hayden, who stands nearly 6 feet, explained that he had consumed less than a litre of weak alcoholic tea five hours earlier, and he’d had nothing to drink for at least three hours. He was fine. Hayden’s girlfriend now returned with her phone, and with a friend, who also needed a ride home. As the SUV and its five passengers pulled away, a second cop stopped them to check the driver’s sobriety. Once again it was obvious Hayden was fine. About this time, Joneil was having second thoughts about walking home. Maybe he could call a friend for a ride. 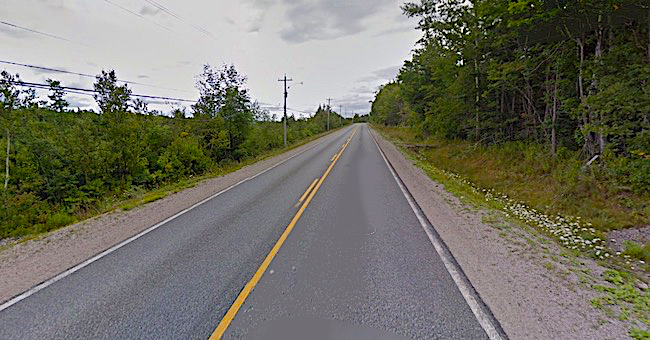 The section of Trunk 223 that passes through Leitches Creek is a two-lane road with unpaved shoulders. The speed limit is 80 kph. At 3:30 a.m., the darkness is broken only by an occasional street light. Joneil, wearing a dark cap, shirt, and pants, pulled out his cell phone and sat or squatted on the pavement, his back to the oncoming traffic, a few feet from the yellow center line. His companion stood by on the unpaved shoulder. Traffic around the site of the party was hellish. Parked cars lined both sides of the narrow road, making a tight squeeze for parents arriving to pick up their freshly minted grads. Party-goers milled about, mindless of the traffic. Hayden navigated cautiously, sticking close to the center line until the parked cars thinned, and the roadway opened up. He gradually increased his speed and had almost reached 80 kph when he spotted Joneil’s companion looming out of the darkness on the shoulder of the road. Eying the young man, Hayden swung gently back toward the middle of the road. A second later he spotted Joneil, crouched in the roadway, and jerked the wheel to the left. Hayden’s girlfriend spotted Joneil at the same instant, and she, too, grabbed the wheel and jerked it left. It was too late. With a sickening thud, the car veered into the opposite lane. Hayden jerked the wheel back, nearly rolling the SUV before regaining control and bringing it to a stop. Contrary to social media rumor, he did not flee the scene. The impact catapulted Joneil into the ditch. Hayden and his girlfriend carried his limp frame to the SUV and laid him in the back. Both had first responder training, and together they began mouth-to-mouth resuscitation and chest compressions. The girlfriend paused to call 9-1-1. An ambulance was already at the party, responding to a minor injury, and it reached the accident site in minutes, as did police. Hayden was distraught to the point of hysteria. He spent much of the next hour crying incoherently—to the point that police decided there was no point taking a statement. Better to wait till the next day. It is at this point that the social media mob and the Chronicle Herald’s anonymous scolds insist police should have demanded breath sample. In a June 13 news release, the CBRM police said, “based on first-hand observations from several officers at the scene, as well as further investigation, there is no evidence to indicate the driver of the vehicle was impaired.” No evidence. To demand a breath sample, the Canadian Criminal Code requires police to have “reasonable and probable grounds” to believe the person is committing an impaired driving offence, or has done so in the last three hours. Officers the scene that night honestly didn’t believe Hayden was impaired, and they had no objective evidence to suggest he was. Notwithstanding the Halifax lawyers, named and unnamed, who listened to Chronicle Herald reporter Andrew Rankin’s one-sided recital of the facts before opining that police should have demanded a breath sample, the police couldn’t have done so legally. This is not a small point. Police can’t violate a citizen’s Charter rights just because it would be convenient for an investigation, or perhaps vindicate their earlier decisions. We should not ask them to do so. On the contrary, we should insist they do not. Disrespecting the Charter would be the ultimate malfeasance. Police began conducting frequent random checks on the Laffin household after receiving threats they urged the Laffins to take “very seriously,” Melissa Laffin said. The Laffins have also installed motion-sensing cameras that automatically record every car that passes the house. The issue of sobriety raises a sensitive point. Social media trolls and the Chronicle Herald have repeatedly accused Hayden of driving drunk. But out of deference to the grieving Hanna family, little has been said about Joneil’s sobriety as he sat or squatted on the pavement that terrible night. Post-mortem tests have presumably established his blood-alcohol content, if any, but police have not released them. Those results could still come out if the family get the independent investigation, or the trial, they demand. Hayden Laffin is a handsome young man with soft features and a light brown stubbly beard. Prior to the accident, he worked unloading lobsters at a local plant. He liked the job. Two days after the accident, his boss heard a false rumour that Hayden was in hospital and expected to remain there for weeks. So he replaced him. Lack of a job has added to the isolation Hayden feels at the centre of a social media firestorm. His mother and his girlfriend have been stalwart in their support, but aside from them, he has little human contact. He’s reluctant to go out, for fear of encountering taunts or violence. Cape Bretoners pride themselves in the strength of their community bonds, but you wouldn’t know it from the Laffins’ experience. Hayden is unused to the spotlight. For weeks he avoided any public comment on the accident for fear it would only lead to more threats and social media trolling. He spoke with me only reluctantly, tearing up frequently when discussing the events that night and the consequences for his family—and for the Hannas, who he knows are suffering even more. Two more loose ends from the rumour factory. Hayden and Joneil never feuded over a girl. It’s just one of those rumours that isn’t true. Also, Melissa Laffin is a single mother. Hayden does not have a stepfather, let alone a stepfather who’s a cop. Twenty years ago, when Hayden was a toddler, Melissa dated a police officer, but they broke up 15 years ago. Police are under intense pressure to charge Hayden with something—anything. You’d like to think they would rise above that pressure, and perform their duties without fear of rabid attacks from Facebook or the Chronicle Herald. You’d like to think that.